Not a super serious article this one, but I found it very entertaining – apparently, Windows XP has a BSOD (Blue Screen of Death) when faced with a WannaCry infection. There’s a very extension analysis of WannaCry here where this information comes from WannaCry: Two Weeks and 16 Million Averted Ransoms Later. That’s the conclusion of Kryptos Logic researchers after a couple of weeks trashing crash-test-dummy machines in the laboratory. Early in the infection, it was assumed – including by El Reg – that unpatched Windows XP systems were part of the problem, especially since it lives on in the systems of early victim, England’s National Health Service. It seems like the initial assumption that WannaCry would have a lot of Windows XP machines involved looks like it’s probably false as executing the payload on XP SP3 machines (the most common), triggered a random BSOD and reboot. It’s still a pretty common OS, I see the majority of ATM machines in Asia running Windows XP or Windows XP Embedded as the host OS. 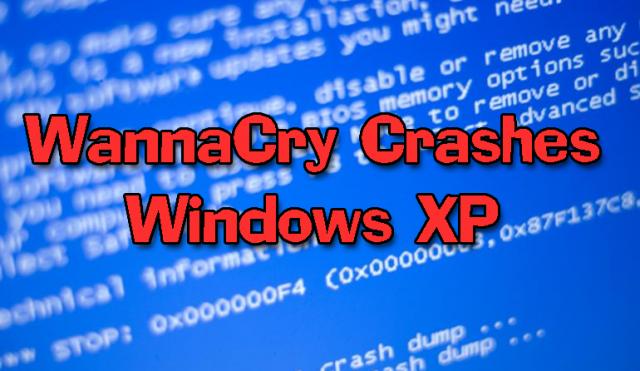 It doesn’t mean that XP was mysteriously protected by its love of BSOD – if you got a user to manually execute it locally, it would encrypt the victim’s files.